Houston's unsually large number of soccer fans does not change the fact there is a reticence to invest in Major League Soccer in the United States. 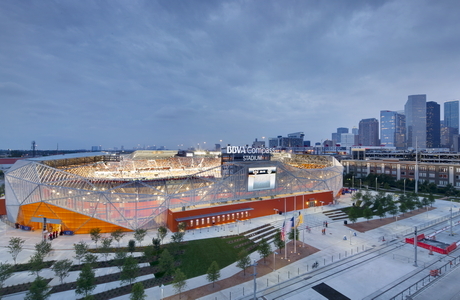 That’s one reason the home stadium for the MLS team, the Houston Dynamo, was achieved on a much smaller budget than most major city sports venues. But the growing interest in the sport among Americans required design foresight: BBVA Compass Stadium would have to be a cost-effective yet world-class venue for professional soccer. Ultimately, the project yielded a striking and popular metal-mesh-enclosed addition to downtown Houston, for a remarkable $95 million final price tag. 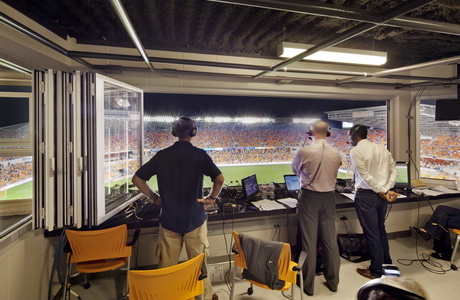 With broadcasts of matches carried by major networks and cable outlets internationally, the press box for the stadium required equal attention to detail – and equal attention to budget constraints. 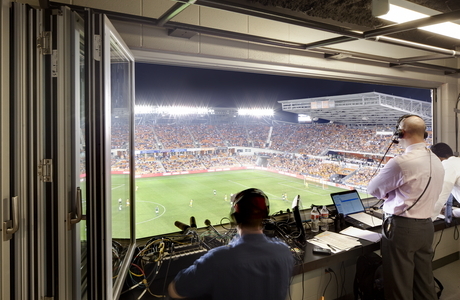 In order to meet the requirements of both broadcasters and owner-clients, a NanaWall system ultimately occupied the window-wall-configured press box. NanaWall's sturdy construction also protects the press box from wind and weather when not in use, and the thermally broken construction provides a high level of insulative value. "It is a program requirement of Major League Soccer and national broadcast networks to provide obstruction free viewing from the television broadcast booths," notes Bruce Beahm, senior architect and associate principal with global design firm Populous and project manager/lead project architect for Compass Stadium. 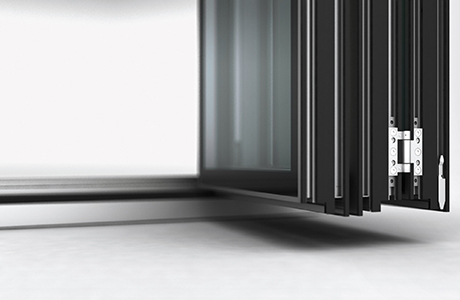 "NanaWall's system meets this requirement when open," he continues, "and further provides the option of keeping the room closed and conditioned, allowing for alternative uses of the space." Beahm also notes that NanaWall surpassed other manufacturers in a highly competitive bidding process. 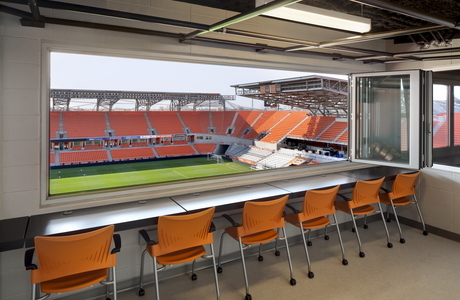 The press box at BBVA Compass Stadium now features 10 panels of NanaWall's SL70 Monumental Thermally Broken Aluminum Framed Folding System, split between two openings. With a running astragal design to provide extra stability, the system offers broadcasters a choice for broadcasts – open air or windowed – depending on conditions. In either case, press box occupants have a perfect vantage point from which to deliver live running commentary on Dynamos match and any other event that might take place on the field. "Whether during events or at non-event times," says Beahm, "and in any weather conditions, the space enjoys views to the pitch making it a desirable space for more than just broadcasts." 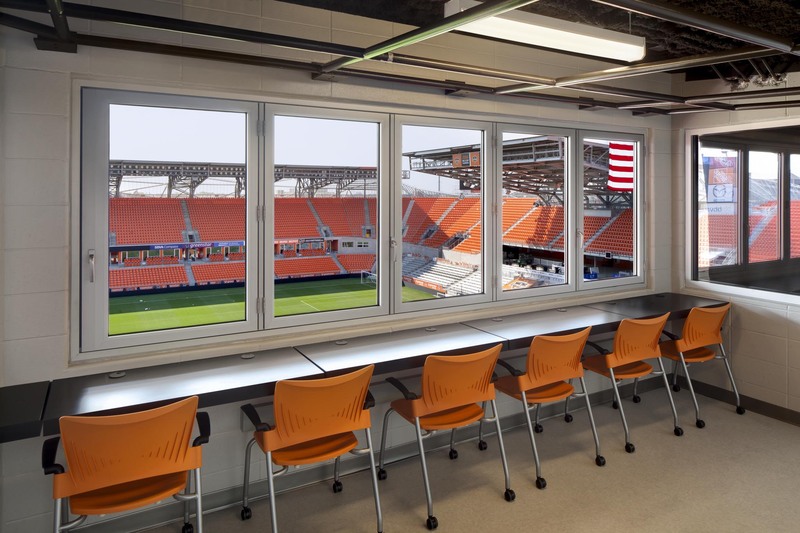 NanaWall's sturdy construction also protects the press box from wind and weather when not in use, and the thermally broken construction provides a high level of insulative value. Remarkably, NanaWall's contribution to the press box suited the tight-budget project perfectly while offering a number of features that competitors' sliding and folding systems could not – in particular, the completely unobstructed view end-to-end when in the fully open position. Beahm also noted the success that NanaWall had in acquiring this piece of business: "The clients required a competitive bid process for all specifications,” he recalls. “Though there were some other systems that met the specified criteria, the project was ultimately awarded to NanaWall based on their competitive bid."